New analysis suggests that almost 1 in 5 people in the United States have no religious affiliation! Media coverage has sensationalized the publication of this analysis from the Pew Forum on Religion and Public Life, and various church and institutional leaders have presented explanations for the increase of the “Nones,” as some call them, and suggestions of how to change the trend. The difficulty is that the analysis from Pew, and in response to Pew, creates an illusion of commonality through the construction of this group ex nihilo. Those who chose “no religious affiliation” have a wide range of attitudes, practices, beliefs, etc. Some are atheist or agnostic (two broad categories in themselves), but reportedly 68% of them believe in some “higher power.” Some pray (41%) and some do not. Some feel a connection to the environment (58%) and some do not. Some think government should shrink (52%) and some do not. What holds the group together is their response to one question, religious affiliation. The assumption/construction of commonality leads analysts to attribute generalizing characteristics to the group despite the data. 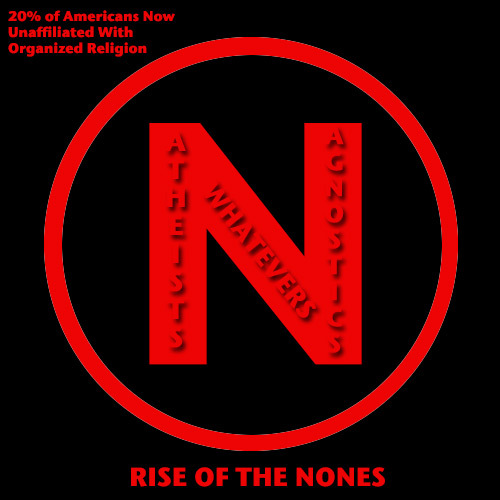 USA Today, for example, reports a lack of political activity among “Nones”, as they do not participate in political organizations or vote as (dare I say it) religiously as white evangelicals. The error of presumed commonality, however, is not limited to a group such as the “Nones.” Assuming commonality for people identifying in similar ways on a survey creates faulty generalized assertions. A recent book by M. Steven Fish, Are Muslims Distinctive? (Oxford, 2011) uses multi-national surveys to query if those who identify as Muslim are more prone to violence, have different levels of religiosity, or have greater education. Despite careful statistical analysis and nuanced conclusions, the work assumes that identifying oneself as Muslim in a survey reflects a substantive commonality, despite differences in specific context (what constitutes illegal violence, political participation, etc., in different nations). The assumption that being Muslim trumps those significant differences is similar to constructing the “Nones”. Rather than the overreacting, we should recognize the Pew data as an example of constructing group labels ex nihilo. Otherwise, respond simply with a shrug. This entry was posted in Politics and Religion, Religion and Society, Religion in the News, Steven Ramey, Theory in the Real World, Uncategorized and tagged "Nones", M. Steven Fish, Pew Forum. Bookmark the permalink.